Needless to say, Gygax had the background in science fiction to qualify. 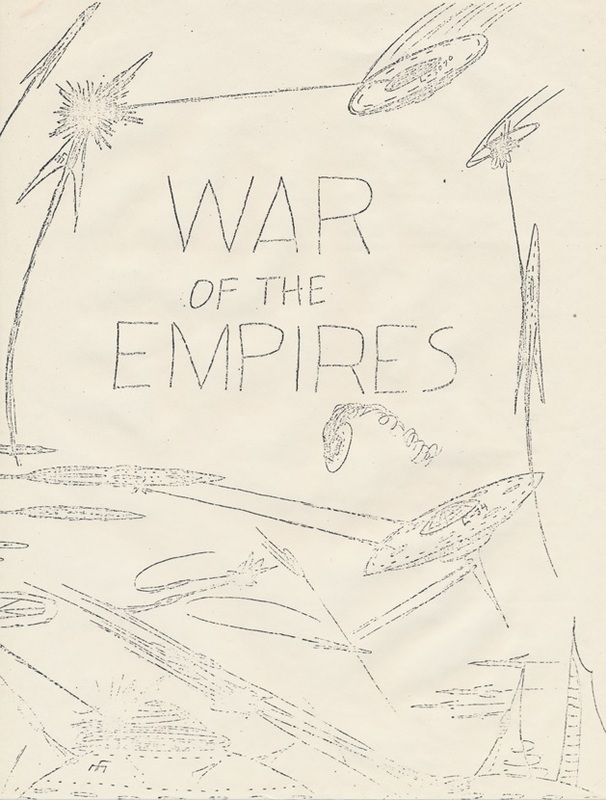 In an article in Dragon #3, aptly named "Does anyone remember War of the Empires? ", he reminisced about his own brief involvement with Tullio Proni's original campaign in 1967, which fell into abeyance shortly thereafter. 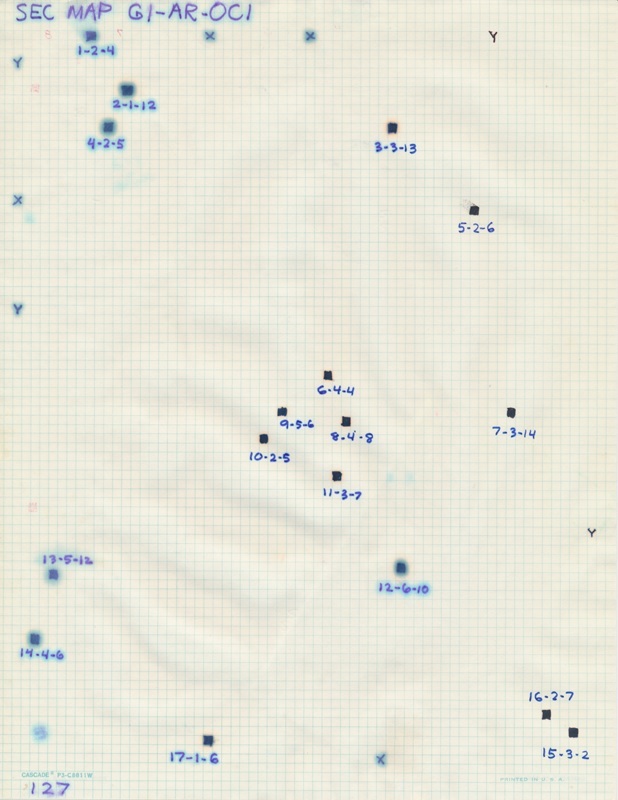 A wave of similar science-fiction wargames followed, like David Montgomery's Galaxy (1968), building on this basic idea of managing an intergalactic empire by seizing planets to strip for resources in order to build armadas of ships and eliminate rival forces. 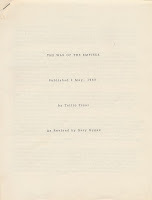 When Gygax began experimenting with game design, he wrote to Proni to secure permission to take over the defunct game and its play-by-mail campaign early in 1969, which resulted in a surviving revision to the rules. We might quibble over whether we should consider War of the Empires one of the earliest 4X games, because both the map and the statistics for each solar system are revealed to the players at game start. Thus, their "exploration" does not involve discovering the location or nature of planets, but merely reaching the planets to colonize them. 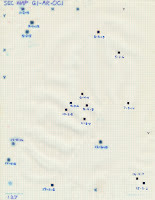 Note that the postal version of Montgomery's Galaxy does have this crucial property: a gamesmaster keeps a secret map of the hexagonal "search board" listing the contents of each solar system, so when players moves into blank hexes, the referee tells them about any systems they discover within. Galaxy also has a system for scientific research that can increase ship speed, range, weapons, and can even decrease ship cost -- concepts that may sound quite prescient to fans of the computer 4X genre. But more on Galaxy will have to wait for another time. 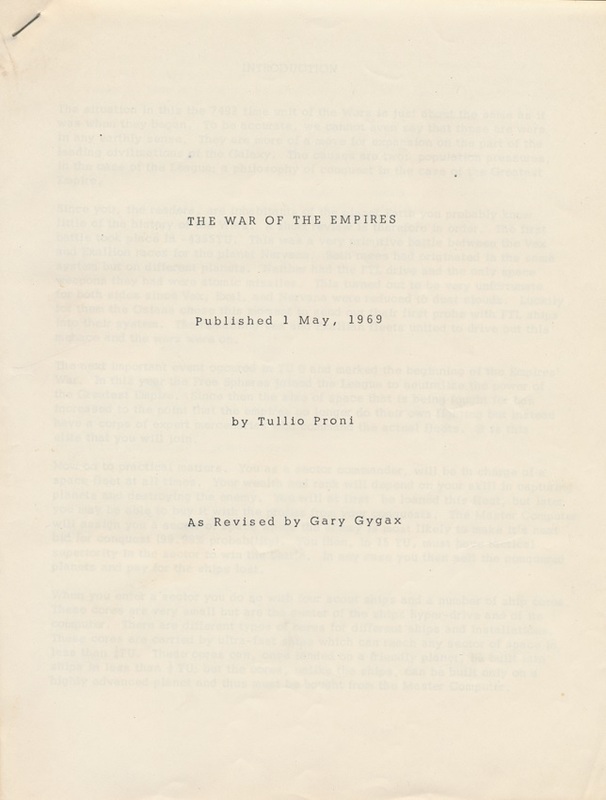 After taking over Proni's game, Gygax also took over his campaign journal, the War Reports. He cannot help himself from detailing his own overlooked successes two years earlier in Proni's abandoned game, for which "Commander Aspirant Gygax" is given various honors by the "League of all Worlds." Anyone who knows the look of the first four issues of the Domesday Book will find the layout of the New War Reports strikingly familiar. The resemblance between the Castle & Crusade Society and the campaign of War of the Empires was more than just skin deep. Among the latter game's eponymous empires is the "Greatest Empire," a dynasty that encompasses a number of persons with various noble titles, which is opposed by the "League of All Worlds." 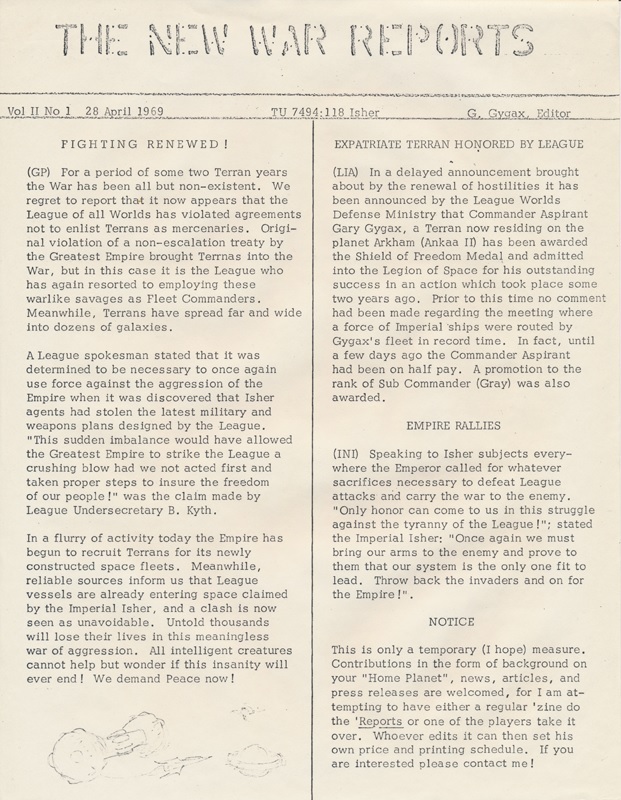 Players could volunteer to involve themselves in the politics of rival imperial factions by notifying the Master Computer, effectively joining a side-game which promised both advancement and peril in the feudal hierarchy. 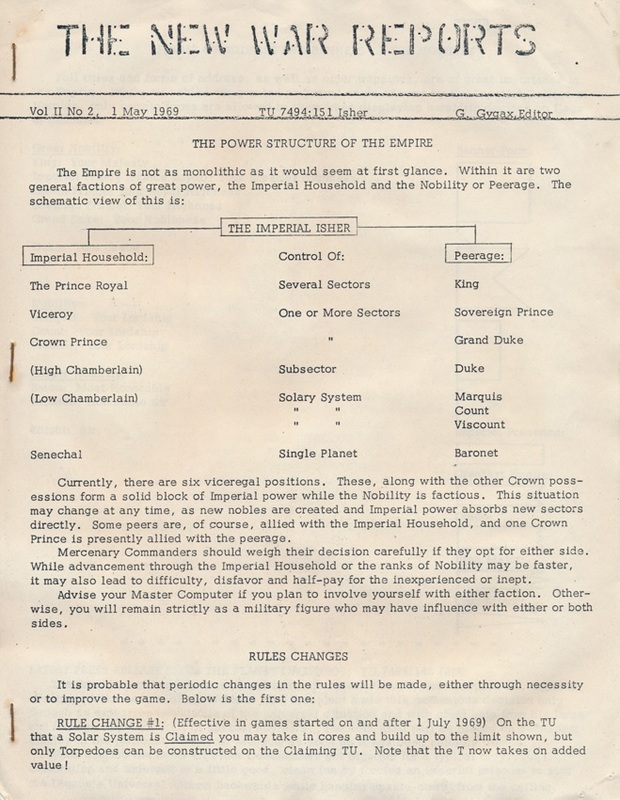 The various positions and titles involved bear no small resemblance to those used by the "Great Kingdom" of the Castle & Crusade Society a year later. Science-fiction fans will surely recognize here some trappings of A. E. van Vogt's Isher setting. The standard path to advancement in the game came though the acquisition of "credits." In War of the Empires, you receive credits for claiming solar systems and destroying enemy ships, and you lose credits when your ships are destroyed. For example, you gain 1 credit for destroying an enemy scout, 2 for a cruiser, and 3 for a battleship. After a sector has been conquered, the victor sells its planets to the Master Computer in exchange for more credits, which can purchase rank in the empires, or buy resources to bring to the next battle for a sector. This elevation in rank through in-game successes may also foreshadow systems familiar in the "Great Kingdom" and beyond. 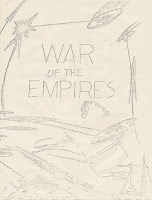 War of the Empires provides a key example of the sorts of paper-and-pencil campaigns Gygax and others were playing in the years leading up to Dungeons & Dragons. Like the Atlantis campaign, it illustrates how intriguing role-playing and story elements were popping up in all kinds of places as the 1970s neared. It also shows us how innovations in strategy games bubbled up from the same well, though this piece can only hint at the vast literature of homebrew science-fiction tabletop games from around this time. There is a tremendous historical wealth in this early material that is just begging to be explored and exploited by posterity. Years later, the enemy of the World of Greyhawk's version of the Great Kingdom is The Iron League, which echoes "The League of All Worlds". Any signs of anagramming and backwards-naming among the players in these earlier wargames too, Jon? 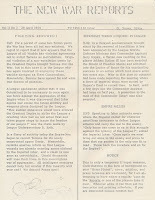 Gygax earned a "Shield of Freedom Medal" from the League for action against the Greatest Empire. Perhaps the name of the "Shield Lands" in Greyhawk, where Gygax played the Earl of Walworth (as Jon as pointed out before), is an echo of that. Not that I readily see. Most people seemed to play as themselves, with their names prefixed by their ranks in the League or Empire. You do see planet names drawn from fantasy and science-fiction literature quite a bit. Fascinating reporting as always, Jon! So what amounts to a tabletop version of "Master of Orion", one of my all-time favorite old school DOS games. That sounds incredible. Excellent work, and such fascinating information. There's a lot of similarity between that and the commercial PBM (play by mail) games of the 70's and 80's (a few of which are still being run today), like StarMaster, StarWeb, Galactic Conflict, etc. The game had a Planet Arkham! "...Commander Aspirant Gary Gygax, a Terran now residing the planet Arkham (Ankaa II) has been awarded the Shield of Freedom Medal and admitted into the Legion of Space for his outstanding success in an action which took place some two years ago"
Gygax was promoted to "Sub Commander (Gray)". 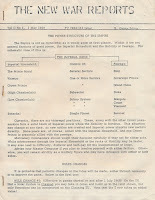 I note that "Gray" is the color of the "Ship Commander and top officials" in Expedition to the Barrier Peaks. Does War of the Empires use a color coding scheme for rank? It does, for the "tabs" on your uniform, but I don't think it corresponds in any obvious way to the MA color bands or the Expedition's color cards. I've only just found your blog via another blogger. Fascinating reading.